Walkways allow us to transition form one location to another, you may choose to create something of beauty or just a simple path to the lake. What ever your needs let us bring your project to reality . 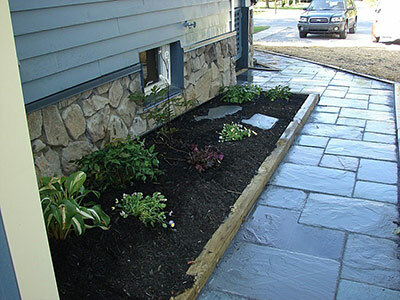 A dry stone path may be all you need or a neutral stone stepping path, maybe pavers from the house to a new patio. These are the things we make happen. Outdoor spaces will never be complete without the walkways. They provide a channel for your guests to traverse on towards your beautiful home. Also, walkways are important in any lawn as it directs people away from walking on your grassed areas especially on your precious garden. Getting the right walkway for your outdoor space is a must in establishing the overall look of your landscaped area. The most basic walkway includes the use of concrete slabs. Meanwhile, there are some homeowners who prefer to have edge on their walkways for a more formal finish. And for sun and rain protection, there are also others who opt to add shades or canopies. Paver walkways may also be built to serve as a follow through and add consistency in the outdoor design. It will also compliment your home’s design and other concrete structures found in your outdoor space. For you to achieve the perfect walkway for your garden, different factors must be taken into consideration. The width of the walkway is crucial as it would create balance to the overall look of your outdoor space. There are also many different choices when it comes to walkways and some are more complicated than the others. 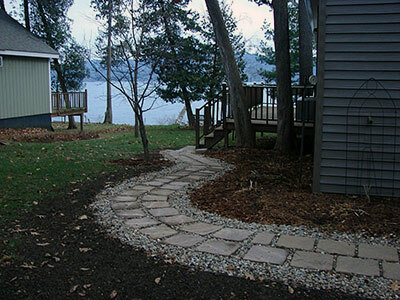 Choosing the right walkway for your Vermont home would also be dependent on your budget. Choices on patterns, colors and techniques used are actually boundless in helping you achieve a decorative and functional paver walkway. Residents of Vermont will never be left behind in terms of giving their homes an amplified and more beautiful look. This is the reason why Rainbow Acres Landscaping is here to guide you in creating a perfect dwelling place for your family. There are so many designs that you can find on books and magazines but still the most popular are the conventional paver walkway designs. Rainbow Acres Landscaping will be a huge help when it comes to choosing the right design and color for your walkway. Colors and styles may range from brick red, grey rose and purple and comes with antique, European and Spanish designs. The patterns can also be achieved through the use of alternative color and style of paver stones. Not only will they look good but they are also very functional when it comes to leading the way to a focal point in the garden. The focal point may be your door or your pool, patio or even a water feature. Different walkway designs are available at Rainbow Acres Landscaping. We see to it that these designs meet the needs of Vermont homeowners. And when choosing the right design, one must consider the degree of traffic. More elaborated designs are however more expensive but the outcome is still worth every dime. So if you are ready to make your outdoor space even more interesting, it is high time that you hire Rainbow Acres Landscaping for your walkway needs. Vermont residents have come to appreciate the landscaping services we offer. Our ever dependable staff will make sure that you receive the best landscaping service that you won’t find anywhere else.